Your Grand Cherokee gives you options for hauling cargo, so why shouldn't your cargo liner? At Just for Jeeps, we love finding innovative products that pull double duty, and this liner impresses us. 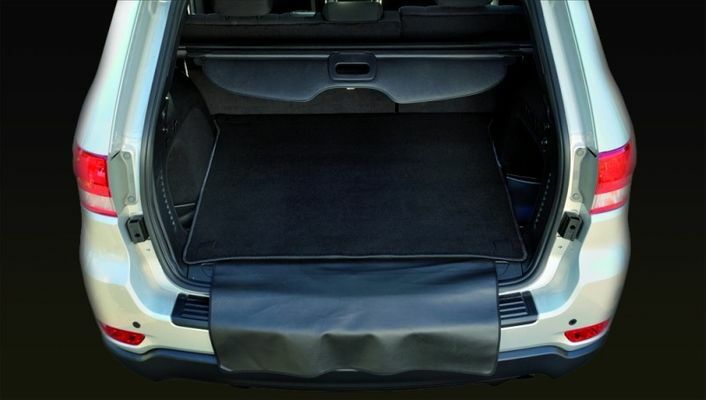 This reversible cargo area mat for 2011-2019 Grand Cherokee models comes with all the quality you'd expect from an item made by Mopar. Depending on your load, you can use a rubber or carpet surface. Loading heavy items with sharp edges? Use the rubber, and keep that load from shifting. Is your gear a bit wet from an adventure? The carpet will absorb that moisture without damaging your upholstery. Our favorite part is a foldable flap that covers the bumper and fascia, giving you extra protection when managing heavy loads. Your seat configuration doesn't matter. This liner will fit like a glove and keep your cargo - and your Jeep - safe from damage. Our staff of Jeep experts can answer any questions you have, and also tell you about our grand discounts and excellent shipping rates. A little oversized, otherwise a good product. A little flimsy but I guess it will do the job.